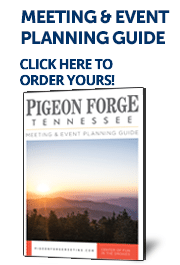 If you’re seeking to inspire your attendees, having a Pigeon Forge meeting is the way to do it! With 145,000 square feet of meeting space at 20 different venues, we have the capacity and flexible space you need. Meeting in our Smoky Mountain town means you get to have productive break-out sessions outdoors on the patio or partake in after-hours events that will allow everyone to let their hair down. With lively entertainment, a five mile long Parkway lined with more than 50 attractions and more than 200 stores available, your attendees are sure to enjoy their time here. Count on Pigeon Forge meetings to be top of the line! Find complete information on our professional meeting planning services within the Meeting & Event Planning Guide.